RightsNow Pakistan, Sindh Progress Lawyers Forum strong condemn violent act by the Punjab Government against civilians protested against the police action for removing the barricades placed in front of Allama Qadri House. We term police act which definitely acted under a command of their provincial departmental head and Chief Executive of Punjab Government, violated citizens rights and behaved brutally crossing all limits. It was also seen that the Government used its non state actors, private persons having political affiliation with the ruling party who were seen on media destroy citizens’ vehicles. Lahore case has exposed Pakistani state, Government and Punjab Government before international community who were using forced against protesting civilians. Lahore massacre in which 8 citizens including two women lost their lives, more than 80 seriously injured. 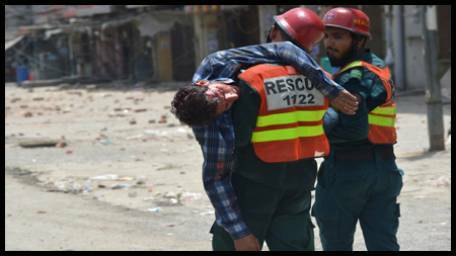 The way police was using force agaisnt citizens showed the world how much sensitive Pakistani police is to human rights. What police did in Lahore, what it is doing in Sindh, or how Governments are using non state actors was seen by the world yesterday in lahore case. In Sindh and Balouchistan province, atrocities of police and other law enforcement agencies was also brought on record and at different forums. There were incident in Sindh of forcedly taking people, killing them and burning them. Same situation of State terrorism is continue in Balouchistan. This also raise a question whether acts of STATE or state actors are accountable before anyone or before judiciary or parliament? Whether any worse form of democracy is better than dictatorship? We call for action against who is involved in lahore incident apparently and in reality, and also other parts of the country.